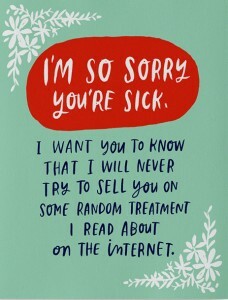 One of Emily McDowell’s wonderful empathy cards. I am sure that people who recommend obscure clinical trials or alternative treatments mean well. They think ‘this could really help them!’ and they only look at the possible upside. We might be grateful for the help, after all, for being pointed to something we might have overlooked. It’s a longshot, but we just might save Lecretia’s life, right? But do those well-meaning people consider the work that puts on us and on Lecretia? Do they consider what happens if we follow it up and it doesn’t help? That, if it were pursued, and it failed, that we would hold a grudge against that person forever, for wasting what could have been quality time with a desperate, dying person on a false lead? At this point, with Lecretia’s time left so precious, we can only look at options that have a scientifically-based track record of helping people with Lecretia’s exact condition. We are terrified of Lecretia spending her remaining time in hospital through side effects and complications, which is the last thing she wants, but which is a real risk with trials and experimental therapies. For example, a very intelligent and well-connected friend of mine reached out to me with an offer of help, without really knowing much about my wife’s medical condition or current circumstances. He had a contact that had a PhD and had helped with ‘all sorts of cancers’. His heart was in the right place, and I know he was only trying to help, after all, everyone wants Lecretia to live, but below is a letter I had to write him in response. I hope he doesn’t mind me publishing it, because in part I would like to send it to everyone who sends me a link to an article on the internet, or a lead for a clinic in Germany or Russia, insisting that we have to follow it up. 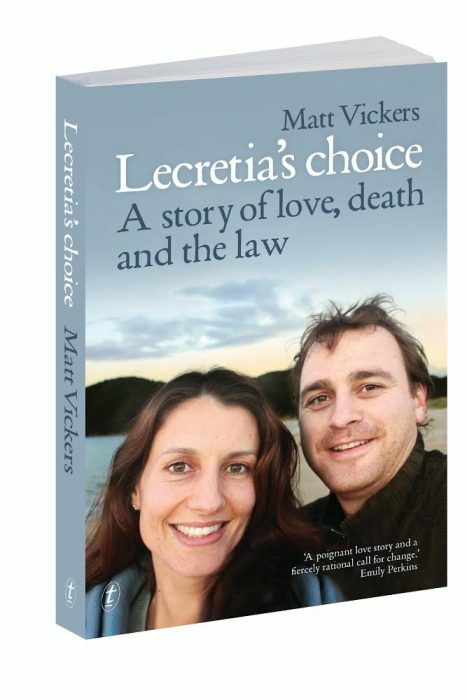 In most cases, if the option is any good, we have already investigated and dismissed it, or they either cannot help Lecretia or she is ineligible for their trial, or they have refused or ignored our pleas for compassionate admission. Lecretia is already taking all the alternative supplements she can that have no or low risk of harming her. We have worked and continue to work hard for my wife, trying to balance reasonable health interventions with what her body will allow, while trying to maintain her quality of life. But more than that we are taking into account Lecretia’s wishes and what she wants to do in terms of treatment. Her scope for exploring new approaches is very limited. My wife has suffered through surgery, radiotherapy and chemotherapy and is now confined to a wheelchair, losing her ability to focus, and her ability to see. She has entered palliative care because her oncology team believes nothing more can be done for her from an anti-cancer perspective. We have received second and third opinions, and they concur with that assessment. The expectation is that she has limited time to live. Giving us false hope at this point would be extraordinarily cruel. We have been sent so many false leads, and we have some quite nasty people making us feel guilty because we aren’t chasing their miracle cure fantasies. We are coming to terms with the implications of Lecretia’s health, and making us feel guilty for accepting what is naturally and likely going to happen is just unkind. We are likely going to have to deal with the loss of someone we love deeply. Dealing with guilt too will just complicate and intensify our grief. So I ask that if you do make a suggestion to me, you do not make me feel guilty if I turn down your help. Because my wife cannot travel, has no desire for further treatment that has little chance of working, and it would take an extraordinary opportunity to make us want to divert my wife from her current path of seeking quality of life from her remaining time on this Earth. If your lead fails, and I expend money and time and effort on it, then that would be an enormous burden on you. You will have screwed over a grieving family. So before recommending anything, please consider whether you really want that responsibility? How confident are you that it’ll work? On what basis? Medical knowledge and experience? The fact it worked with Lecretia’s precise medical condition? An article you read? Did you evaluate the sources? Because that’s what I’ll have to do. I’ll have to spend time poring through scientific articles to evaluate the chance it’ll work for Lecretia, spend mental energy on a judgement call on whether it’s worth putting everything on the line for, instead of spending time with her. Or is it just hearsay? A hunch? We don’t have time for ‘it might work’ or ‘what have you got to lose’. We could lose everything. We could lose our last remaining precious moments with Lecretia. That is what is at stake. We only really have time for certainty. I get recommendations all the time from unqualified strangers, and I can dismiss those. Dismissing a recommendation from a person I respect is a harder thing to do – and I hate to do it. So please be careful and think hard before putting me in that position. I am sorry for being so blunt with you. But I worry that you may not appreciate the enormity of our personal situation and how involving yourself in the way you propose might affect our relationship, which I value greatly. As a result, my friend replied that he would follow up with his lead and qualify it before coming to me with it. He has changed tactics from putting the work on me to doing the work himself to really evaluate what he is proposing and whether it can help Lecretia in particular. I’m utterly grateful for that. If you’re the sort of person to recommend medical treatments to strangers with the intent of trying to help, and I don’t mean just Lecretia, I mean to anyone who is facing a terminal illness, my advice would be to do the same. Be skeptical. What is the science? Do you really have the skills to evaluate the science? Is there any science at all? How many failure stories sit behind the success stories? Have you qualified the truth of the success stories? How similar are the circumstances to the person you are trying to help? And if this is so successful, why hasn’t it been peer-reviewed? Why hasn’t it been adopted by the oncology community? Why isn’t it part of the standard of care? It costs you nothing to send a link, but it can cost a family a lot to receive it if it isn’t qualified and its veracity and relevance evaluated. Please don’t put the work on the family. They just don’t have the time. If you want to advocate a treatment, I’d suggest that the right approach is to lobby the scientific community to evaluate and peer-review it, rather than pushing it on to desperate families who are already agonising over every medical decision. We want to imagine that all cancer is treatable. That we can always beat it. That there is always an answer. The statistics tells us that that is just not true, and that is the sad reality. Lecretia hasn’t given up yet, and she has no desire to die, but she is facing very tough odds. We have to be very careful about next steps, so that we can give her the best possible outcome, without putting what she has left at too much risk. Yoka and I had the same issues during her illness, especially as it progressed. While being very well-meaning, a number of people suggested all sorts of alternatives including a doctor. Yoka got her hopes up over an alternative hyperthermia treatment in Germany so her sister travelled there to check the place out. Her recommendation was to stay well clear. It was a crushing blow after raised hopes and excitement. I’m glad you’re following the path you’ve chosen as time is now precious. Our oncologists in NZ are world class and will try everything they can that has been peer reviewed. Wonderfully written. Been following this blog and can see the commitment, dedication and love that Lecretia, Matt and your whole family and friends have for each other much beyond the case or the cancer and you are right that what you need to focus your limited energy and resource and time right now is on what matters. The knife-edge nerves and dread that come with a terminal illness are not what I would wish on anyone, having seen a family member go through that, and well-meaning but ill-informed advice can add to that. I think it’s time we learned how to just be – be supportive, be kind, be there. Hi Lecretia, I belong to ChCh End of life Choice group. Absolutely convinced that New Zealanders should have the choice to end their lives if they have a terminal illness or have unrelenting, irreversible, unbearable pain. Everybody should be able to die comfortably and consciously. You will make this possible.I won’t forget you Lecretia. Big hugs. From Clare. Thank you for the education. Well meaning people can not know without being taught. As an outsider, and bearing in mind I know nothing of her last moments, her fears of lacking dignity at her death can’t be further from the truth – she has come across as a very dignified person and so courageous too.